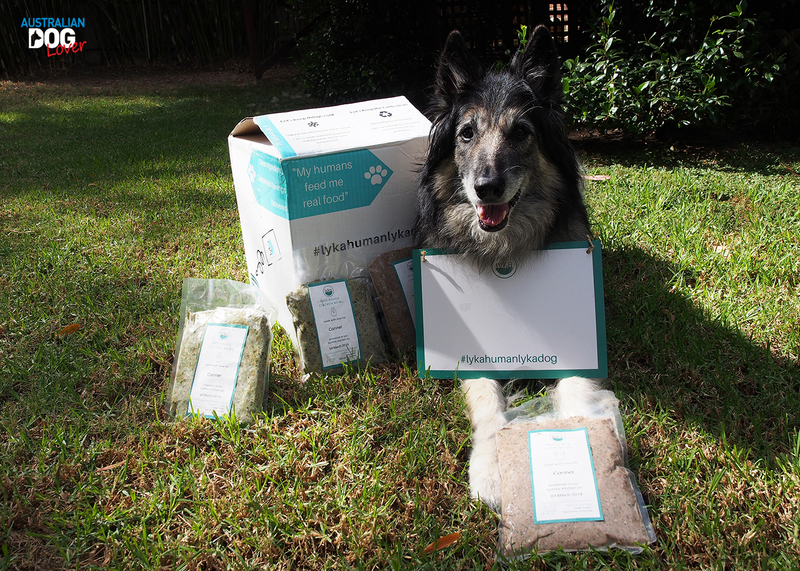 Lyka Pet Food Pty Ltd is a human-grade pet food subscription company that was founded by animal lover and dog owner, Anna Podolsky. 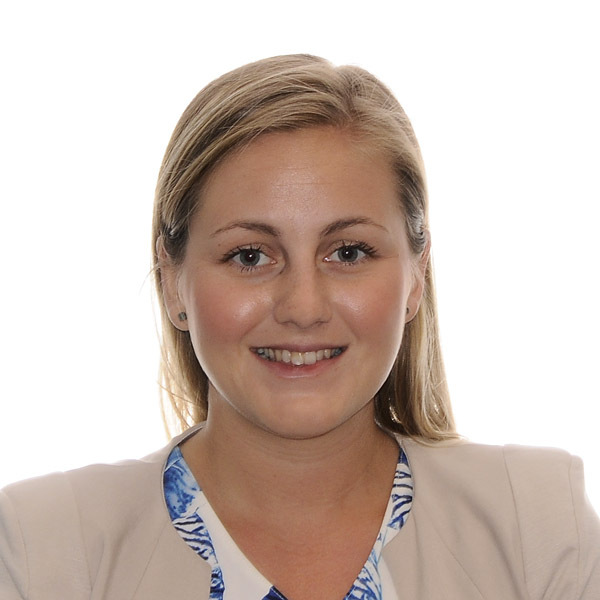 Anna’s passion for pets and business was showing at an early age when she started her own pet sitting and dog walking business. Back in 2015, when Anna’s Border Collie cross Lyka was only 5 years old, she was losing fur, getting bald patches, itching with allergies, low on energy, and had tooth decay bad enough for a vet to recommend tooth removal! After conducting some initial research, Anna switched Lyka’s diet from premium brands of commercial pet food to a real food diet. Within months, she found that all of Lyka’s issues subsided, and she was back to her happy, healthy self. Anna believes all dogs have the right to a real food diet - and she founded Lyka in 2018, to provide just that. Lyka’s mission is to redefine pet food by disrupting an industry that hasn’t seen innovation in decades. Each serving is tailored to your dog’s needs, through the use of clever algorithms designed in conjunction with vets and pet nutritionists. There’s no one-size fits all here. The first step is to create your dog’s profile on the website including their age, weight condition etc. and Lyka’s vet-derived algorithm instantly calculates the right portion size for your dog. Lyka sources local ethically produced, farm fresh ingredients, that are prepared at a low temperature in their human grade-kitchen and delivered to customers doorsteps in four days or less. What is Conner getting now? Special meals with his name on them? Hardly seems fair, bro! 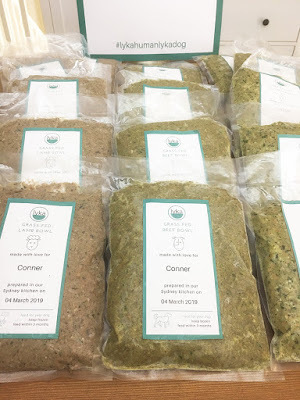 The word “fresh” is often misused but not in this case ... Conner’s meals were prepared on March 4 with our first dispatch delivered right to our door early on March 6. Pouches were frozen prior to shipping and would have kept safely in the shade for a few hours thanks to the re-usable ice packs and a layer of WoolCool insulation in our box. 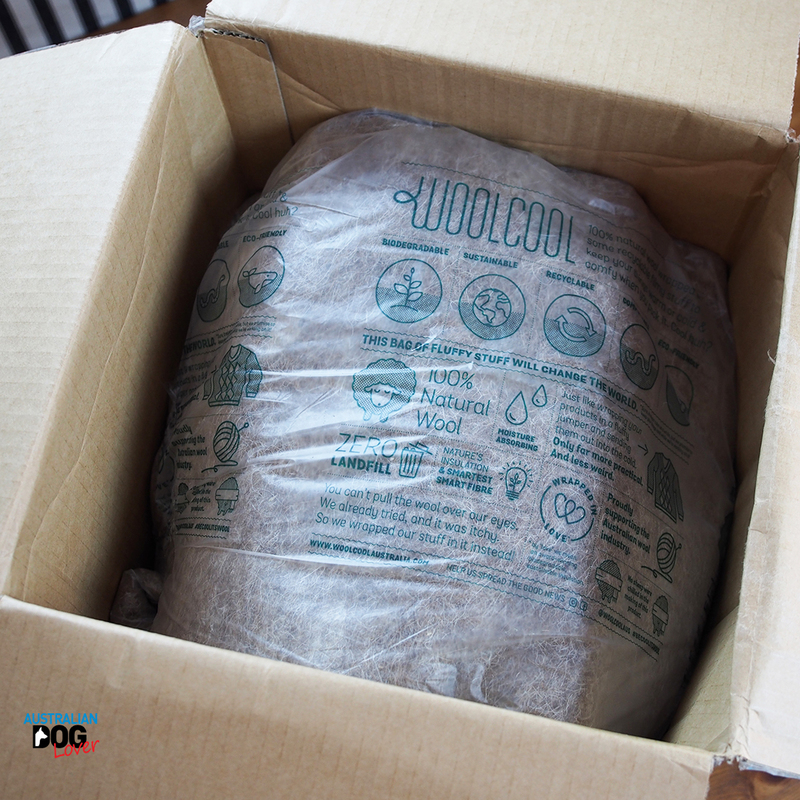 Not only is this 100% natural wool layer (and the box) fully recyclable, it also supports the Australian wool industry. Even the food pouches (they need to be washed first) are 100% recyclable. Since our dogs care more about eating the food than saving the planet, this is what we received for our two week trial with Conner. Our box came with an individual fact sheet tailored to Conner advising to feed him one 575g pouch daily (split between 2 meals in our case). A large sturdy clip is provided to ensure you can keep each pouch fresh and tidy in between meals. Check at the bottom of your box because we missed ours at first! If you occasionally forget to transfer your frozen pouch from the freezer to the fridge 2 days prior to feeding to slowly defrost, fear not! You can also defrost your pouch quickly using a pot of boiling water. All three recipes are formulated to meet nutritional values established by AAFCO Dog Food Nutritional Profiles for all life stages. This is pretty standard but a closer look at the ingredients shows Lyka Pet Food goes above and beyond the 'minimum requirements'. 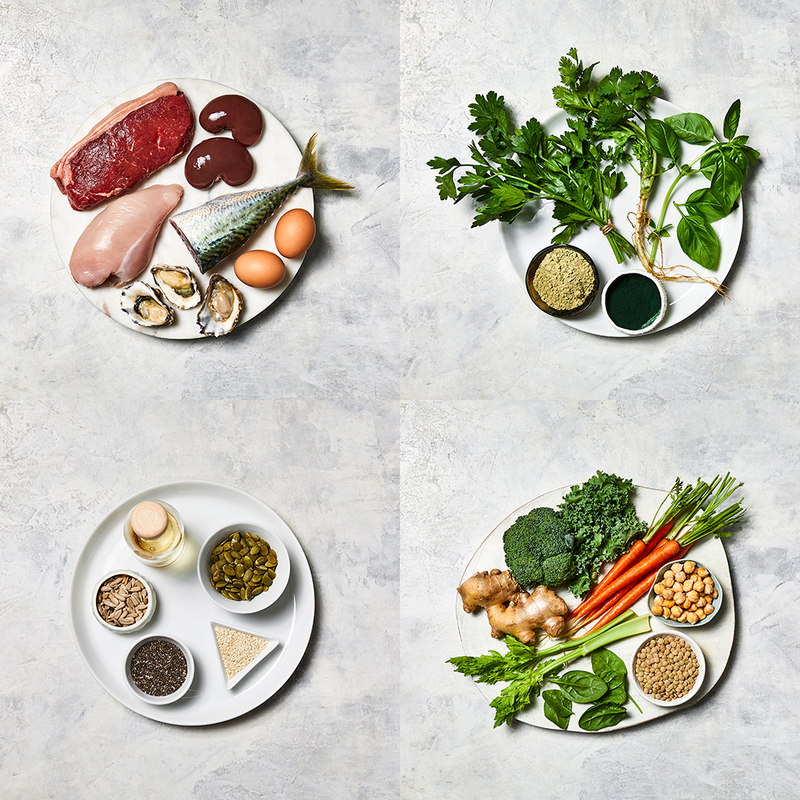 No synthetic vitamins or minerals are needed and the low temperature cooking means nutrients remain in the food. 2. the exact nutrient profile breakdown showing the exact amount of crude protein, fat, carbohydrates, fibre, ash and moisture. As with introducing any new food, the success (avoiding stomach upsets and other unmentionables) lies in transitioning your dog slowly and monitor closely any changes in their stools or behaviour. Week 2: switch to 100% of the new food. If your dog's poop is runny or loose, simply stay at the same stage for an additional 1-3 days. It's true that you can't beat first impressions ... First and foremost, high paws for how quickly our first order was processed and delivered by Lyka. We signed up on a Friday to have our personalised order cooked on Monday and received by Wednesday morning and we don't live close to the CBD! Both orders (a fortnight apart) were extremely well packaged and the first one included one of the most comprehensive set of marketing collaterals we've ever received, which in our opinion immediately creates a sense of professionalism and this in turn builds trust. 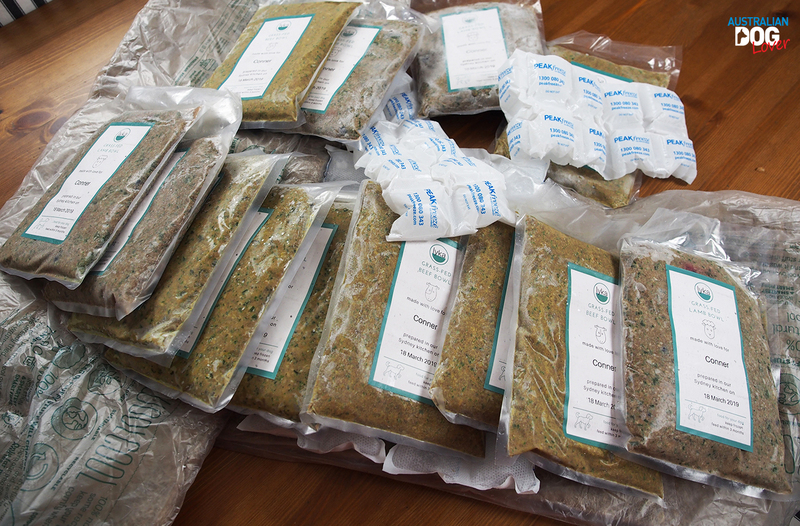 Each pouch was clearly labelled with the recipe name and date of preparation. Once frozen, these meals will keep for up to 3 months in your freezer. The first recipe we trialled was 'Chicken Bowl': the smell of fresh basil was unmissable and brought all the dogs back from the yard! This is a flexible subscription that can be paused or cancelled at any time. If you're on a regular delivery schedule, the next delivery date will feature in your fact sheet so you can plan ahead and maybe get a family member or friend to bring it inside place the pouches in the freezer straight away. However the ice packs and insulation around the pouches will keep them refrigerated for hours. 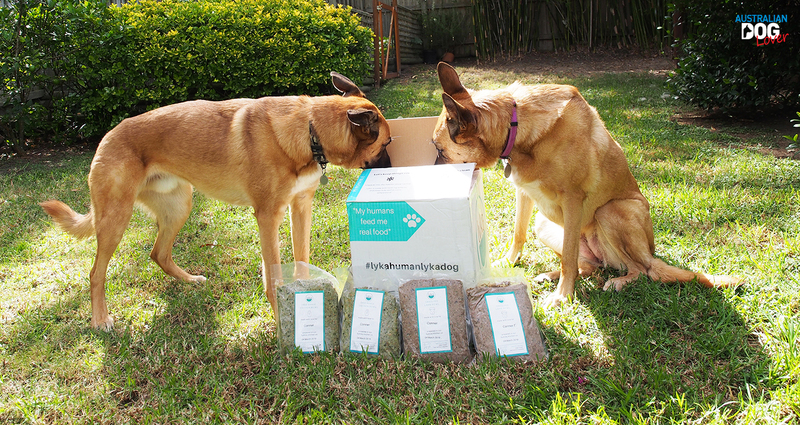 Thanks to a new generation of dogpreneurs like Lyka Pet Food, the Australian pet food landscape is changing rapidly providing us with more choices and holding the industry as a whole to higher standards. With no fewer than 3 major dog food recalls in the past 12 months, it’s refreshing to see that some companies go through that extra step to offer real premium dog food and personalised customer service. Price will obviously vary depending on your dog's weight and whether you opt for the all-meal or half-meal option. For our 30kg dog, it would work out at $58.80/week. NB: A 1-week trial is available for both the all-meal and half-meal options. 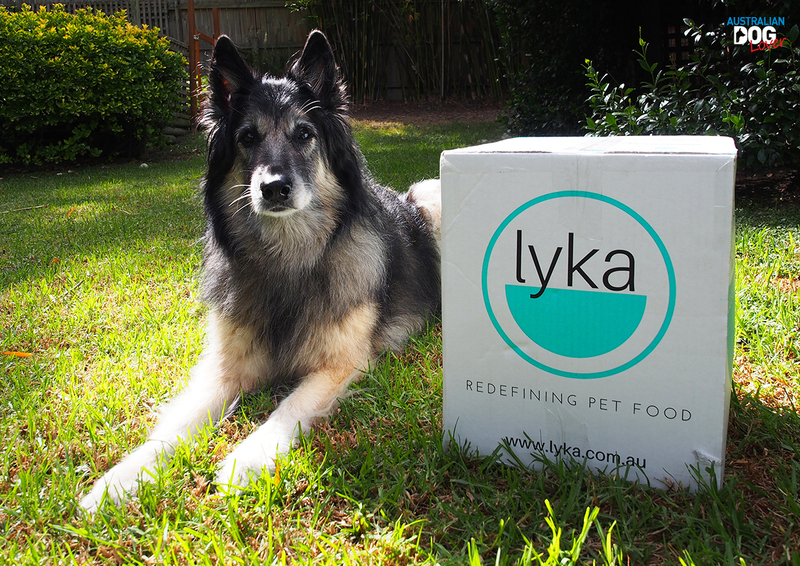 Lyka Pet Food already delivers to Sydney and surrounds as well as metropolitan Melbourne, Brisbane, Gold Coast, Sunshine Coast, Canberra and Adelaide. Disclaimer: A complimentary 4-week trial for one of our dogs was provided to us by Lyka Pet Food to facilitate this review. We only accept a handful of products for reviews simply because we only want to trial the best for our dogs but this latest offering from Lyka Pet Food did capture our interest.